By now, most of us are diligent goal-setters. We understand the importance in our pursuit of innovation of having clear objectives, setting measurable and achievable goals, crafting intelligent strategy, and measuring what matters. Innovation is, at the onset of any new group or project’s thought process, exciting and packed with potential. It’s what happens next that too often derails the progress made in those early planning stages. Even as ideas crystallize, they threaten to morph and grow, splintering off and taking on a new direction of their own. Scope creep looms large around every corner. Concepts allowed to become scattered rather than concentrated can begin to cause portfolio bloat. As ideas not closely enough related to what it is you’re trying to accomplish are allowed to flourish, you may begin inadvertently stepping on toes. Worse yet, learnings become dispersed. 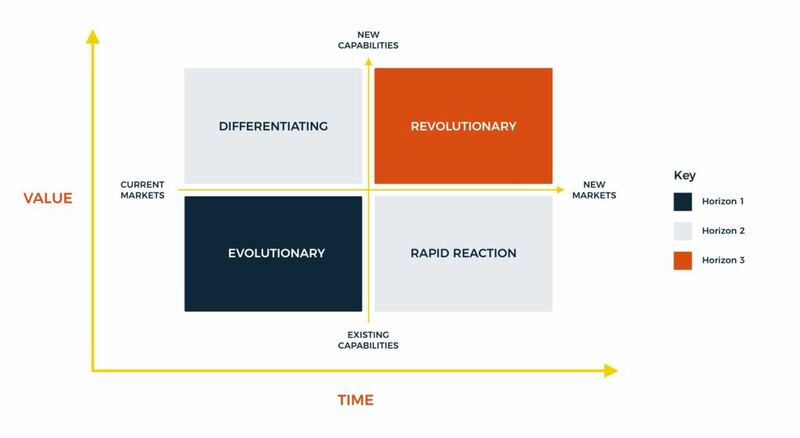 Defining your innovation scope is a critical first step, but it’s just the beginning. In the sprint to validation, the judicious use of a sharp pair of scissors is critical. The number one danger here is not that a lack of ideation or creativity will stall out your ability to innovate; it’s that too many competing ideas will hinder your ability to progress on any given one. You must be ready to trim, pare down or completely sever and let go of any bulk that impedes progress. I find it helpful to take a portfolio approach to innovation, as a sort of filter for segmenting and balancing incoming ideas. At Skookum, we often combine classic portfolio models (Ansoff Matrix and Horizon Models) into a single layer, this categorizes ideas while providing a rough estimate of when value could be realized. We need to create that opportunity to say, You know, we need to fill this bucket over here. We’re too heavily indexed in this other side. We have to be able to quickly evaluate ideas and set them aside if they aren’t a fit within the scope. We can’t afford to lose focus of our efforts. Often, innovation teams can avoid the revolutionary bucket, not for the inability of big thinking, but the business will curtail the idea by saying “People won’t get it,” “It just won’t work,” “It’s not realistic, or “We don’t have time for this.” We can’t afford to let individual biases and limitations guide our ideation. One remedy for keeping your biggest ideas alive is focusing on the Minimum Viable Idea. How much can we simplify here while retaining as much validated learning as possible? What is the most stripped down, efficient version of this? Which elements are unnecessarily creating bulk or slowing us down? What does this big, ambitious idea that seems impossible on its face actually look like in its simplest form? What’s more, stakeholder morale is critical in innovation. Examining input within the context of a portfolio framework aimed to generate a Minimum Viable Idea gives team members better direction on the types of input that will be most useful. Achieving balance across the portfolio enables us to take great big, ambitious ideas forward with confidence. It allows us to innovate quickly and intelligently, executing lean and agile while still thinking in very big terms. I’m looking forward to sharing more insights with you from the exciting work we’re doing in the Innovation Lab we’ve created for a Skookum client. Stay tuned! In the meantime, reach out to us if you’re looking for guidance in improving your own innovation process.